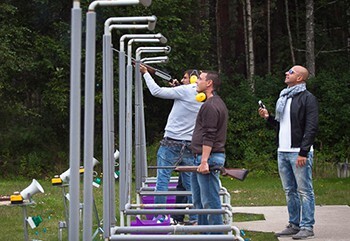 Riga target shooting is one of the most popular and wanted holiday activities in Riga. And the reason is - great spend of time, exciting shooting experience and possibility to shoot from real guns. For wine lovers and experts we have great proposal - Riga Wine tasting. You will be able to visit one of the Riga wine tasting measure. You can visit it together with friends or individual. Riga Beer Bike is fantastic and fun entertainment for big friends group. You can unite two great activities - cycling and beer drinking on the way enjoying nice view of Riga streets and people. You think You know what is real fear and adrenaline? If not Riga Fear Track will show You what is the most scary holiday daytime activity which makes people scream, run and even cry. Riga High ropes are made for those people who prefers active recreation with little bit of adrenaline. High ropes are perfect activity for this. Passing this track You can fell adrenaline, fun and adventure. This holiday package includes two great and mind blowing activities - crazy rotor and tobogganing. Both these activities will make Your head spin and mouth scream. Jurmala - seaside city in Latvia for great summer activities and parties. Latvian party people use to choose this place also for family weekends of just for sport activities. Feel action, excitement and adrenaline playing Paintball with Your friends! This is Your chance to show Your friends who is the boss! Here You can scream and loose Your anger, running with a paintball gun in Your hands. If You love speed and competition, this is for You! Riga cart racing track offers You challenging and varied track with long straights, exhilarating corners and much more! This is the best carting track in Baltic states, here You will discover new power of speed. Enjoy wonderful time in the biggest aqua park in Baltic states. 13 sliding tubes, many pools, 4 different saunas, jacuzzi, pool bars and many more. Enjoy swimming in inside or outside area. Take Your friends and have a great time. It may look hard, but with help of friendly instructor this is going to be really easy. Riga Wild Tunnel is something new on this planet. People have been working for a Years to make this happen and You have a chance to try how it is to feel life a bird! Riga 4x4 off road is for those who likes to heat up adrenaline and try real off road track driving on difficult passable roads with hills, water and mud. These care are made for roads like these and only real driving masters can pass these tracks.